The Mettler Tote Bag is a rugged padded tote bag for carrying a Sys*Stim or Sonicator Unit (MET-ME294, MET-ME940 MET-ME992 and MET-ME994) along with its accessories complete with shoulder strap. Ultrasound Accessories can be found in our extensive online collection of products from globally recognized and trusted brands, including Mettler Electronics. 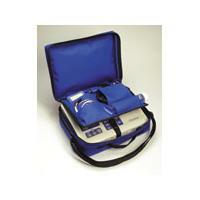 An excellent option to consider is the Mettler Tote Bag for Sys*Stim or Sonicator Units.